International Journal of Trend in Scientific Research and Development (IJTSRD) ISSN: 2456-6470 2456 the quantification of the received solar energy, eithe either on the maximization of the solar incident radiation through the use of light concentration lens lens. The solution developed in this paper is innovative related to the above referred approaches as this system is autonomous regarding the information needed to process the optimal orientation and it is intelligent in a way that it monitors, on a real-time time base, the photovoltaic energy production and it avoids systematic failures coming from changes on the assumed values (position, initial infrastructure orientation, on, cleanness of the photovoltaic cells, etc.). 2. SYSTEM DESCRIPTION: A. Overall System Presentation The overall system is presented in fig. 1. The complete strategy is composed by 5 sub--systems: 1. Electro-Mechanical Structure 2. Control Unit 3. Supervisory System 4. Wind-meter 5. Photovoltaic Park. photovoltaic park ark in order to transfer the new optimal orientation to all PV-production production panels. Mechanical Structure B. Electro-Mechanical The operational subset of the tracking system, named Electro-Mechanical Mechanical System, is presented in figs 2 and 3. This structure has two DOF, motorized m by stepper motors with incorporated encoders; in order to track exactly the prescribed path. The mechanical system was designed using standard industrial Aluminium profiles in order to obtain a simple and economic structure. The mechanical structuree is mainly composed by Bosch Profiles and Aluminium plates. The two motorized axis are composed by Step-motors Step assembled to Aluminium shafts. Figure 2 illustrates the several main components of the mechatronic system: Part n. 6 = Step-Motor Motor to control axis axi 1; Part n. 7 = Step-Motor Motor to control axis 2; Part n. 8 = Photovoltaic cell (150mmx150mm). Fig.3 Design of Degree of freedom Figure 3 details the two designed degrees of freedom (DOF). 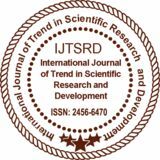 International Journal of Trend in Scientific Research and Development (IJTSRD) ISSN: 2456-6470 2456 C. Control Unit The control unit consist of PLC Siemens S7 S7-300 system (Programmable Logic Controller). This control system has the complete operational management of the tracking system. The main tasks performed by the system are:  Controlling of the two stepper motors;  Processing the data from both encoders;  Processing the voltage oltage signal coming from the Solar-Cell;  Processing the data from the external proximity sensors that informs the system about the hard hardhome position reference. In the developed supervisory system, the SCADA application lication manages the overall system dynamics. The Communication flux between the supervisory system and the control unit is illustrated in fig. 5. The SCADA PC is simultaneously a SCADA server and an internet server, as the implemented SCADA application is web enabled. LC controls directly the tracking system and This PLC commands all other Solar-Panels, Panels, from the solar Park, through a Profibus-DP network. Figure 4 shows an example of a solar park with several PV-Panels. Panels. Figure 5 illustrates the Profibus network implemented in this study. Figure 5 This Figure from a first solar white paper. “’Grid-Friendly’ Utility-scale scale PV Plants,” Plants, illustrates the basic architecture and components of a Plant-level Control system 3. EXPERIMENTAL PROTOTYPE A. Physical Description The prototype built followed the design presented in figure 2. This system incorporates a PVPV cell150mmx150mm, Pmax=1,12W, (Polycrystalline Silicon wafer) and the whole structure is made of Aluminium alloy. In fig. 6 the global developed prototype is shown. Fig 4 Solar Panel Power Plant D. Supervisory System A SCADA system (Supervisory Control and Data Acquisition) is implemented to monitor and supervise the tracking system. A Supervisory Control and Data Acquisition (SCADA) System is used as an application development tool that enables system integrators to create sophisticated supervisory and control applications for a variety of technological domains, mainly in the industry field. The main feature of a SCADA system is its ability to communicatee with control equipment in the field, through the PLC network. As the equipment is monitored and data is recorded, a SCADA application responds according to system logic requirements or operator requests. B. Implemented Control Algorithm The software used for the PLC programming was the Siemens Simatic Step 7, with the Simatic 7 ProdaveV5.5 needed for the communication between the Scada system and the PLC network. The designed control algorithm was implemented using the Ladder Diagram language. The developed control algorithm lgorithm is illustrated in fig.8. fig. Additionally, the PLC-tracker tracker has a modem for GSM communication that provides the system capacity to communicate through the mobile phone network. The driving unit is composed by two motorized axis, with the following characteristics: 1. Axis 1  Step motor: Nanotec ST4018L0804, 50Ncm;  Opt. Encoder: HP HEDL-5540 5540 A14, 500 Pulses  Coupling unit: Oldham D5  Proximity sensor: Omrom EA2 M8 PNP 2. Axis 2  Step motor: Nanotec ST5918L1008, 170Ncm;  Gear box: Nanotec PLE40-1S-4  Opt. Encoder: HP HEDL-5540 5540 A14, 500 Pulses  Coupling unit: Oldham D25  Proximity sensor: Omron EA2 M8 PNP Figure 7 details the electro-mechanical mechanical structure of the developed sun-tracker system. International Journal of Trend in Scientific Research and Development (IJTSRD) ISSN: 2456-6470 2456 Box1: After start is activated, the system initiates the search for the maximal power generated in axis 1, with an angle increment α10. 10. The system stores the power generated in variable P1. Box2: If P1 < P max, the system goes to Box 4, and follows for a new position; Box3: If P1 > P max, this position is stored in the variables: α1max, α2max. The max Power value, P max is actualized with the new Power value P1; Box4: Counter for axis 1 is updated; Box5: After all orientations for axis 1 are evaluated, regarding a fixed orientation ntation for axis 2, axis 2 is positioned in a new position, with an angle increment α20, 20, and axis 1 returns to its initial position α1=0. The system re-initiates initiates the search for the optimal orientation of axis 1, regarding the new position of axis 2. The information formation flux returns to box 1. Box6: After all orientations for axis 1 are evaluated, regarding all different positions of axis 2, the system compares the maximal power found (P max) with the initial Power generated, before the search process had begun (Pin). Pin). If the new Power value is greater than a pre-defined defined gain, this new correspondent orientation (α1max, α2max) 2max) is sent to all park panels. If the power gain is not enough, the new found position is not to follow by the other PV-panels. Box7: After a pre-defined time interval (K) the tracker system initiates a new complete search process in both axis. The information flux returns to box 0. C. SCADA Supervisory System The SCADA system used to implement this monitoring and control strategy permits the selective access to the application, depending on the user’s responsibility degree. In this paper we developed three user levels: Operators, Supervisors and Administrators. Fig 9 SCADA view of Solar Tracker As this SCADA platform is web enabled, all the GUI displayed data is also on-line line accessible through the internet. In fig. 9 it is shown the developed main menu for the sun-tracker system. The on-line line available information, referring actual data from the tracker unit is: actual position for both axis, actual PV-power PV generated, max. daily PV-power power generated, actual efficiency ratio. 4. CONCLUSIONS The developed tracker for sun radiation worked very well. The increase in power generation, in relation to other Solar Energy-systems, systems, without tracking devices, is of similar magnitude (ca. 25%) as for other usual tracking solutions. However, this system has h a relative advantage, as it measures exactly the controlled co variable: the actual Solar power generation. Note: If we can just utilize 5% of the total available solar energy on earth surface, it will be 50 times the energy which is required by the whole world. w And in this way, there will never be any shortage of power supply except in case of non-availability non of direct sunlight. In such case, the other sources of power can be used so that we use as much less fossil fuels as possible. Several SCADA menus were built. The main characteristic of a SCADA Menu is to be ssimple, explicit and quick on transmitting the information to the operator or to the System administrator. REFERENCES JOURNAL / CONFERENCE ONFERENCE PAPERS 1. 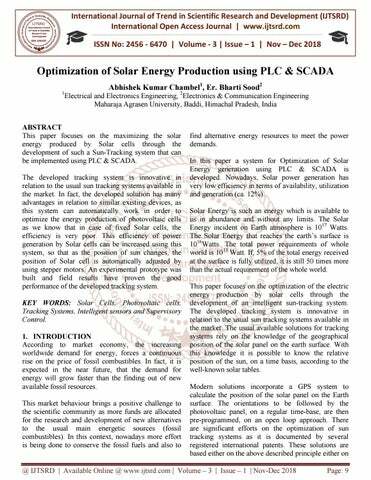 Bajpai P, Kumar S, “Design, development and performance test of an automatic two-axis two solar tracker system”, Annual IEEE Conference Publication, India Conference (INDCON) 2011, Electr. Eng. Dept., IIT Kharagpur, Kharagpur, 1616 18 Dec. 2011, 1–6. One of the developed Graphical User Interfaces (GUI) is shown in fig 9. Electron. Eng.,  7] Simatic Net – NCM S7 for Profibus/ FMS. SIEMENS 12/2001. 6. System Software for S7-300 S7 and S7-400 – Reference Manual, SIEMENS 08/2000; A5E00069892-02 7. Simatic S7 Prodave S7 – Toolbox for PGs and PCs, SIEMENS, 2001 8. Simatic S7-300 – Ladder Logic (LAD) for S7S7 300, SIEMENS, 2001. 9. WinCC-Advanced/Pro Advanced/Pro for SCADA Systems 10. Weiping Luo ,” A solar panels automatic tracking system based on Omron PLC”, Asian Control Conference(ASCC)2009, Wuhan University of Science & Engineering, ng, China, 27-29 27 Aug. 2009,1611-1614. 11. Zhang Bao-jian, jian, Gao Guo-hong, Guo Zhu Yanli.”Designment of automatic tracking system of solar energy system”, 2nd International Conference on Industrial Mechatronics and Automation, 2010, Comput. Sci. Dept., Henan Inst. st. of Sci. & Technol., China, 30-31 30 May 2010689–691.